In subject matter as much as in artwork style, A Silent Voice illustrates the wide gulf that separates Japanese anime from traditional American animation. Not in a million years would Disney approach this material. Animation in the United States is viewed as pure entertainment for families and, on those rare occasions when serious issues are addressed, it’s done in as non-threatening a manner as possible. The Japanese, however, believe that animation is just another way to tell a story and nothing should be excluded. This is evident in A Silent Voice, which uses drawn images to peer into the dark corners of teenage life: bullying, self-loathing, and depression. Although ultimately about healing and redemption, the movie doesn’t flinch when addressing elements that would cause a Disney executive to kill the project. Based on the manga by Yoshitoki Oima, A Silent Voice explores the relationship between the prankster Shoya Ishida (Miyu Irino) and the good-hearted deaf girl Shoko Nishimiya (Saori Hayami). Confused and uncertain about how he feels about the newcomer to his elementary school, Shoya resorts to bullying: taking Shoko’s hearing aides and throwing them out, calling her names, and generally harassing her. Although she initially tries to be friendly with Shoya, his intransigence and immaturity makes it impossible and, devastated by his actions and those of his friends, she transfers to another school. In the wake of her departure, Shoya is ostracized and, when we next encounter him in high school, he is a loner sunk deep into depression. He has no friends and contemplates suicide. Two things happen to offer him a second chance: helping out a terrorized boy at school and re-connecting with Shoko whose isolation matches his own. A Silent Voice doesn’t follow the traditional “outcast boy and girl fall in love” storyline. To the extent that there is a romantic element to Shoya and Shoko’s relationship, it remains in the background (except for one instance when Shoko admits her feelings but Shoya misunderstands what she’s saying). The film has bigger fish to fry. Shoya and Shoko are both damaged and director Naoko Yamada takes great pains to ensure that viewers understand their demons and are engaged as the characters confront them. The primary viewpoint is Shoya’s and, as such, we understand how deeply alone he feels. He is crippled by guilt over how he treated Shoko and believes every bad thing that happens to him is deserved. For her part, Shoko is beset by a similar feeling of worthlessness – one she is able to set aside for a while after she and Shoya reconnect but which eventually resurfaces and causes her to take a drastic action. There are times when the narrative feels fragmented and confused. Had it focused clearly on Shoya and Shoko, it might have been more coherent. The presence of too many half-formed supporting characters interferes with the dynamic between the leads. According to sources, those characters had well-developed arcs in the manga but, because of time constraints (the film is already 130 minutes long), truncations and condensations were needed in this interpretation. Naoko Yamada is regarded as one of the “up and coming” animated filmmakers seeking to fill the void created by the retirement of Hayao Miyazaki. Considering the artwork in A Silent Voice, it’s easy to see why. The backgrounds are rich and the characters, although appearing like traditional anime types, have a sense of individuality. Yamada also understands how to use the “camera” to its best effect. For example, many of the shots from Shoya’s perspective focus on people’s legs and feet – this is because he rarely looks anyone else in the face. His gaze is always directed downward. There are also some gorgeous images; two in particular come to mind. In one, Shoya is gazing down into a carp-filled stream and his reflection can be seen in the rippling water. In another, Shoko is silhouetted against a backdrop of exploding fireworks. Not being an expert in manga, I can’t provide a detailed analysis of how faithful the film is to its source material but there are other reviews available that can do that. 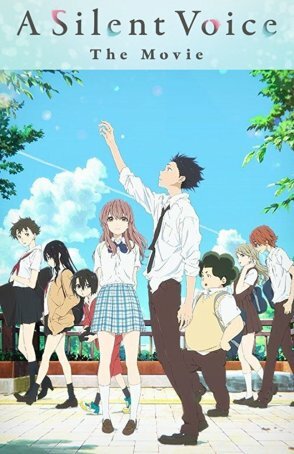 My perspective is one of a more casual anime viewer and, while A Silent Voice doesn’t stand high enough to reach the pinnacle of some of the greats of the genre, it’s a solid enough effort to make it worth seeing and it offers a more rewarding experience than any of the tepid American-made animated efforts I have seen thus far in 2017. Its challenging content and well-crafted visuals more than counterbalance any narrative unevenness.